BuzzAround.Info collects financial information for the sole purpose of completing a sale. When ordering, your information is kept secure in our website database for 6 months from the time you purchase, for your reordering convenience. 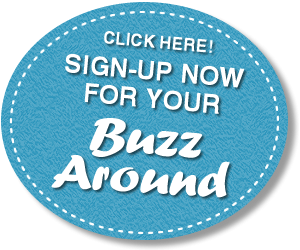 Emails collected for the distribution of our e-newsletters are kept in Constant Contact for BuzzAround use only. We do not sell or share emails given to us. Entrants to our contests are giving us permission to share your contact information (name, email, phone number) with the businesses providing the prizes.